Synopsis: When your beautiful son comes to you and says he has had feelings of suicide, your heart skips a beat. You do whatever it takes to get him help. When your beautiful son comes to you and says he wants to become a woman, your world is suddenly turned upside down. A million thoughts invade your mind. Fear becomes your constant companion and tears swell up inside you every time you think of what could be waiting ahead. You can't help feeling pride in your child for showing the kind of courage that would be needed for their long road ahead. You watch as your family struggles to come together and stay together in what will be the most trying of times. Review: This is an excellent read and I just could not put the book down. Before I knew it I had finished the book within hours of me starting to read it. This is an inspiring story that would be an helpful read to anyone going through this situation or to the family of someone who is transgender. Throughout this book there is a strong sense of heart warming support within this family network especially whilst they are facing difficult times and decisions that may lead to a lot of negative reactions from people outside of the family. I think that it is excellent that they stuck together as this would be a great barrier against any negativity they may have had to face. I would recommend this book to anyone who enjoys an excellent read and enjoys a happy ending for real people dealing with real issues. I love this book as it shows that love and support are enough to get a family through the hardest of times. 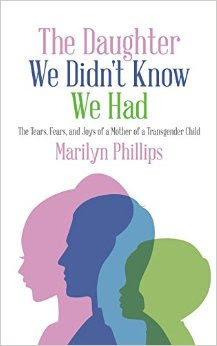 I would like to thank the author and her family for this book, it really is such an excellent read, and for sharing such a personal and difficult story with complete strangers as a way to show your support to your daughter and to try and help others who are possibly struggling with being transgender. Rachel, congratulations on having the courage to make the decisions that were right for you and having the support of your family. You have such an amazing family and you are just amazing. Be sure to stay strong and beautiful. Marilyn, Thank you so much for posting that giveaway and I am so glad that I won and had a chance to read this excellent story. I am posting this review as a kindness to you so that others may see and buy your book and receive any help that it may encourage them to get. I will be sure to treasure this book and pass it down through the generations to come. I hope that if one of my children turn out to be transgender that I handle it with as much love and support as you did.